Repair, or demolish and build new? This was the question on the minds of staff at the Sheboygan Water Utility in the city of Sheboygan, Wis., who were facing a decision regarding their 87-year-old, four-million-gallon water reservoir that serves a population of nearly 50,000. In addition to being an integral part of the city of Sheboygan’s water distribution system, the reservoir is an iconic structure based on its longevity and unique architecture. raSmith was retained by the Utility to complete a hands-on structural inspection, structural assessment and life cycle cost analysis. Ultimately, the results of the life cycle cost analysis enabled the Utility to make an informed decision regarding the future of the reservoir and made it easier for the community to schedule and budget for planned improvements over the next several years. 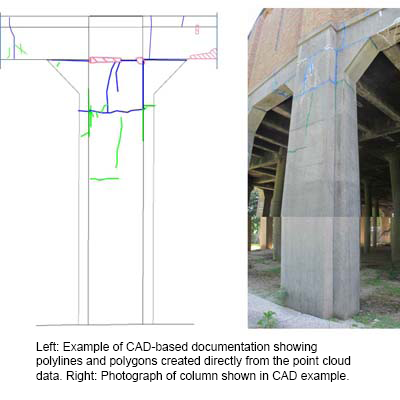 A unique combination of traditional and non-traditional equipment and methods was used to accurately and efficiently quantify structural deficiencies. raSmith’s inspection and evaluation approach primarily consisted of a visual inspection and hammer sounding of the reservoir; marking of deteriorated areas using a color-coded scheme; and 3D laser scanning the sub structure of the reservoir. The scanning process known as LiDAR (Light Detection And Ranging) is a remote sensing technology that measures distance by illuminating a target with a laser and analyzing the reflected light. This technology is able to capture data at a rate of up to one million points per second. Combining a traditional structural inspection effort with the innovative use of color static LiDAR facilitated accurate quantification of thousands of pieces of data related to the marked deficiencies on the surfaces of the structure. Another area of the structure that was not visible from above but required evaluation was the elevated concrete support slab. LIDAR was used to uncover signs of distress by identifying any areas of the slab that were “sagging” (i.e. lower) than surrounding areas, which would be evidence of excessive deflection and possible failure of the slab. None were detected. However, it was discovered that the slab slopes to the middle of the reservoir, which is not shown in the original construction drawings. This was likely a field change that was made to allow the reservoir to drain more freely for maintenance purposes. The LiDAR component of this project provided a tremendous opportunity to demonstrate how this technology can play an important role in structural inspections, evaluations and life cycle cost analyses. It was imperative that the public understand the extent of the needed repairs as a decision was needed to either build a new structure or repair the existing one. A determination of how much the contractor should expect to fix was needed to develop a dollar estimate. It would have taken a long time to measure a four-million gallon water reservoir by hand and the measurements would have been crude. Manual methods also would have increased construction costs when considering contractor contingencies. The difference in using LiDAR amounted to measured quantities being within +/- a few square feet versus hundreds of square feet. Overall, tighter control on measured quantities using markings and LiDAR scanning equated to lower bid costs, which was a direct benefit to the community. This water reservoir project is a strong example of taking a key community asset with both functional and historic preservation value and determining whether (a) it’s worthwhile to rehabilitate the structure (and if so, to what extent) considering the level of deterioration exhibited and the budget available for repairs or (b) it’s more cost-effective to demolish the structure and construct a new, replacement reservoir. This case study further demonstrates how traditional and not-so-traditional methods, including a hands-on structural inspection, structural assessment, life cycle cost analysis and use of LiDAR scanning can be applied to other structures of various size and complexity that require structural evaluation and rehabilitation. Scott Ginal is the director of structural services at raSmith, overseeing a staff of 28 structural engineers and technicians. He has more than 17 years of structural design experience, including bridges, retaining structures, wastewater treatment facilities and buildings. Jon Chapman is a senior project manager at raSmith. He has 25 years of extensive experience in LiDAR (3D laser scanning), 3D visualization and UAS services, working with clients in architecture, engineering, construction, and local, state and federal government. raSmith is a long-time ACEC WI member. The Taylor Hill Reservoir received a 2018 Engineering Excellence State Finalist Award.